Asking Sri Lanka not to worry about India's economic size, Prime Minister Narendra Modi on Friday said both the countries should move boldly to conclude a Comprehensive Economic Partnership Agreement and attract investments. He said Sri Lanka has the potential to be India's "strongest economic partner" in the region and his government would try to boost bilateral trade and make it more balanced. 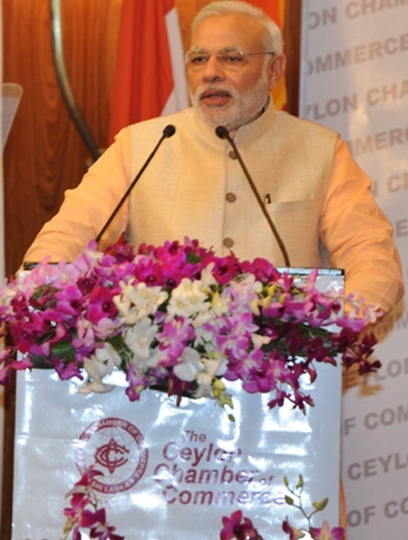 Addressing Sri Lanka's business community at the Ceylon Chamber of Commerce, Modi said, "I often say that a nation's fortunes are linked to its neighbourhood. There are many in India who would argue that India is too large to need her neighbours. "There are many in our region who worry that India's economic size will hurt them. I disagree with both views. For one, we all need a stable and peaceful neighbourhood to concentrate on national development," he said. The Prime Minister acknowledged that there were concerns in Sri Lanka about the huge trade imbalance. "I am prepared to work with you to address them. I want balanced growth in trade. We will try to make it easier and smoother for you to access the Indian market," he said on the first day of his two-day visit to the country, the first by an Indian Prime Minister since 1987. "I also believe that countries do better when the entire region moves together," he said. He said that the SAARC region was rich in resources and constitute a large market. "We complement each other. Therefore, our cooperation can be of huge benefit to all of us," Modi said citing examples of smaller neighbouring countries like Nepal and Bhutan which have benefited from partnership with India. "There are already powerful examples in South Asia that show us that differences in size is no constraint to beneficial partnerships, if we use our strengths and seize our opportunities," he said. The Prime Minister said India is opening up to the world and have Free Trade Agreements with ASEAN and others. "We should ensure that Sri Lanka does not fall behind in the changing and competitive world. That is why India and Sri Lanka should move boldly to conclude a Comprehensive Economic Partnership Agreement," he said. "You should also attract investments from India for exports to India. That should be the natural outcome of our proximity and your strengths," he said. Modi said the global confidence in India has been restored and the world's engagement with the country is at a new level. "But, the first claim on us should be that of India's neighbours," he said, adding "there is new purpose and clarity in our policies; a new vision for inclusive development; new standards in our governance; and, a new level of energy in our economy." Earlier addressing Sri Lankan parliament, Modi assured Sri Lanka of India's "full commitment" to development partnership it. Modi said in the last quarter, India was the fastest growing global economy. "We are confident that we can grow even faster. The progress of one-sixth of humanity is a major economic opportunity for the world," he said. The Prime Minister said he would be happy if India becomes a catalyst for economic growth in the region. "That is why I speak of a neighbourhood where trade, investment, ideas and people move easily across the borders." India will do its part for the region, he said. "We will work to integrate our markets more. We will make trade smoother and possible through the most direct routes. We will invest in regional connectivity. And, we will share our capabilities in science and technology with South Asia, from advanced medicines to disaster management or space science. "As a friend and neighbour, we attach the highest importance to Sri Lanka's economic progress," he said. "It (Sri Lanka) has an excellent location. And, it has won peace now. Sri Lankan businesses have shown that they can compete with the best in the world. "We are pleased to be Sri Lanka's largest trading partner and one its largest sources of investment. Our Free Trade Agreement in 2000 was a pioneering initiative in the region. It has given a big boost to our trade. Sri Lanka's exports to India have grown sixteen times – yes, sixteen times – since then," the Prime Minister said. In 2012, the trade between India and Sri Lanka stood at over $4 billion. India enjoyed a trade surplus of nearly $3 billion. Modi said Indian investments can upgrade and expand Sri Lanka's infrastructure. "I am pleased with progress on Sampur Thermal Power Project and the Trincomalee Oil Farm. That is good for Sri Lanka's energy security and for our partnership. I also believe that when we connect the lives of people, we strengthen the bonds between nations," he said. The Prime Minister said India has extended visa on arrival facility to Sri Lankan nationals from April 14 and the two nations should do more to connect to each other by air and sea. "India and Sri Lanka were, in some ways, better connected in the past than we are now! In the past, a person could buy a rail ticket in Colombo and travel to Chennai by rail and ferry! Air India's decision to launch direct flight between our capitals will help reverse that trend," he said. "India's progress gives us the ability to create opportunities for our neighbours. Our development partnership has injected commitments of $1.6 billion in assistance from India. That has helped rebuild and upgrade infrastructure in Sri Lanka," he said. "I believe in Sri Lanka's capabilities. We should engage more. We should open up to each other more. We should move forward with greater belief in our own strengths; more trust in each other; and, more confidence in the fruits of our partnership," Modi said.